Water Veil: This Pokémon cannot be BURN condition while having this ability. Spinning its tails at high speed they can move at jet speed through water. It uses the fins on its arms to lash out at its opponents. Must drown someone while holding a Water Gem. Through the shock of realizing they had just killed someone, something clicks in the Floatzels brain causing it to evolve, the Water Gem helps give and extra push in the evolution. 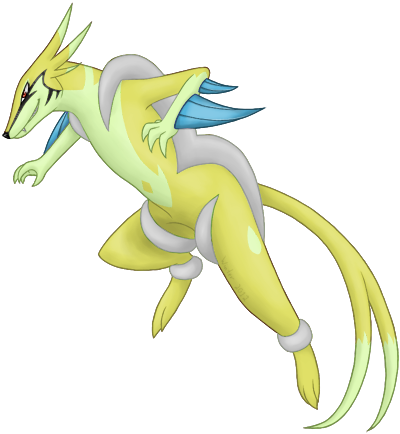 Levizel is a lot more lean then its pre evolved forms, making it fast on both land and in water. The newly developed floatation device on its legs are able to make it float atop water without the rest of its body being submerged. It looks as if it is standing on water from afar. It has also developed a mischievous complex. It has been known to pull fisherman into the water by there line and drag them down to the bottom of the sea or river they live in, some being drowned, others managing to make it back to the surface before that happens. It has a somewhat evil way to have fun, making it a game to see how long a none water pokemon can stay underwater before running out of air.